Sometimes, we all want to bury our heads in the sand during October. But we’re so much more effective when we stand up with all the other thousands of people who feel the same way, and turn our anger into action. 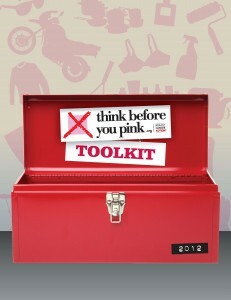 Get your very own FREE Think Before You Pink® Toolkit containing all the information and tools you need to deepen your understanding of the politics of breast cancer and help others learn the truth about breast cancer and pink ribbon marketing. Hold a screening of the groundbreaking documentary Pink Ribbons, Inc. in your community and provide people with an alternative way to think about breast cancer during October. This provocative film features our former Executive Director, Barbara Brenner. You can get in touch with our staff to get a DVD of the film, and we’ll help you start planning your screening. 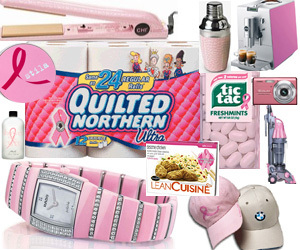 Connect with us on Facebook and Twitter to get your daily dose of cutting-edge analysis about pink ribbon marketing and breast cancer politics all month long, and to ensure you get all the updates about this year’s Think Before You Pink® campaign. Join the Bay Area BCAction community at our 3rd Action Speaks Louder Than Pink – Food for Thought event on October 10th. There won’t be a pink ribbon in sight because the event will be filled with people, like you, who have had enough of pink ribbons and want more concrete action to address and end breast cancer. Come enjoy an evening of great food and cutting-edge activism with us. Together in over 12 years of work to hold pinkwashing corporations accountable and put companies on notice, we’ve made “pinkwashing” a household word. They’ve even made a movie about it, Pink Ribbons, Inc. We’ve seen so much change in the breast cancer movement thanks to the bold and fearless activism of people like you. We will continue to demand transparency and accountability in breast cancer fundraising. And we will continue to push the breast cancer movement to demand real change for women living with and at risk of breast cancer. Women’s health must always come before corporate profits. Thanks for standing with us for real change in breast cancer.